Well believe it or not, Thanksgiving is just over one week away. ONE WEEK. Craziness, right? It’s hard to believe how fast this month is flying by. 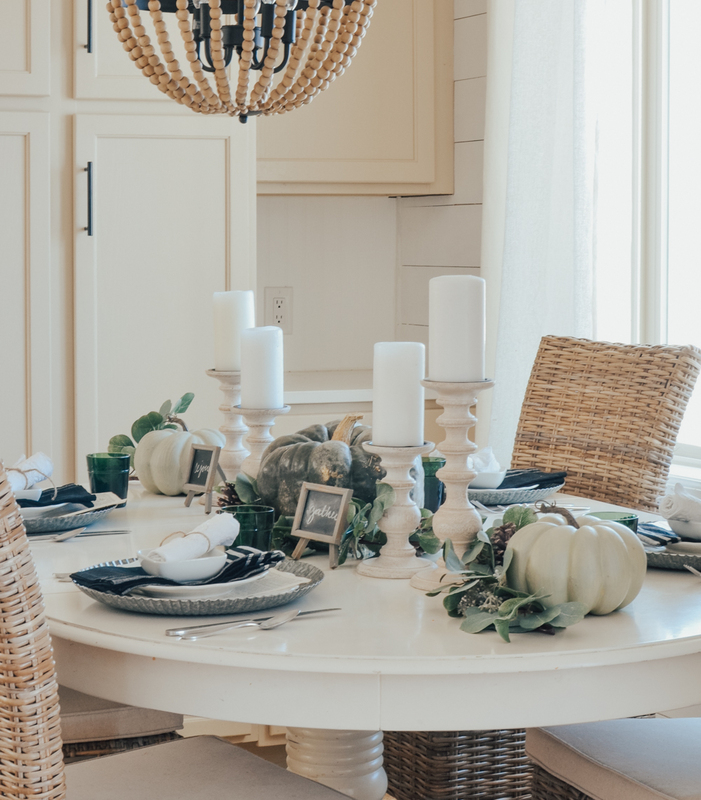 And even though many of you are probably already starting to think about Christmas decor, I still wanted to share my Thanksgiving table today because I just love this holiday so much. It’s all about two of my favorite things in life: food and family. I mean, what’s not to like about a day completely dedicated to eating and hanging out with people you love? It doesn’t get much better than that in my book. 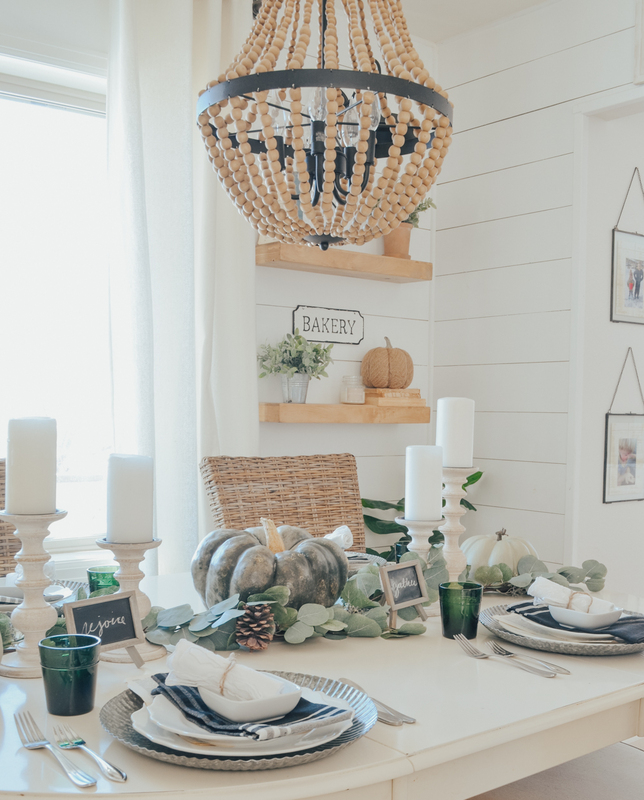 Anyway, I styled a very simple Thanksgiving table that I hope gives you a few ideas for your own home. I also gathered up some unique and sentimental things you could do with your loved ones to celebrate the day. I’ll be honest, I’m not the biggest fan of super fancy tablescapes. I don’t feel like I’m very good at putting them together and I typically lean more towards a laid back table. This Thanksgiving inspired look is about as fancy as I get! 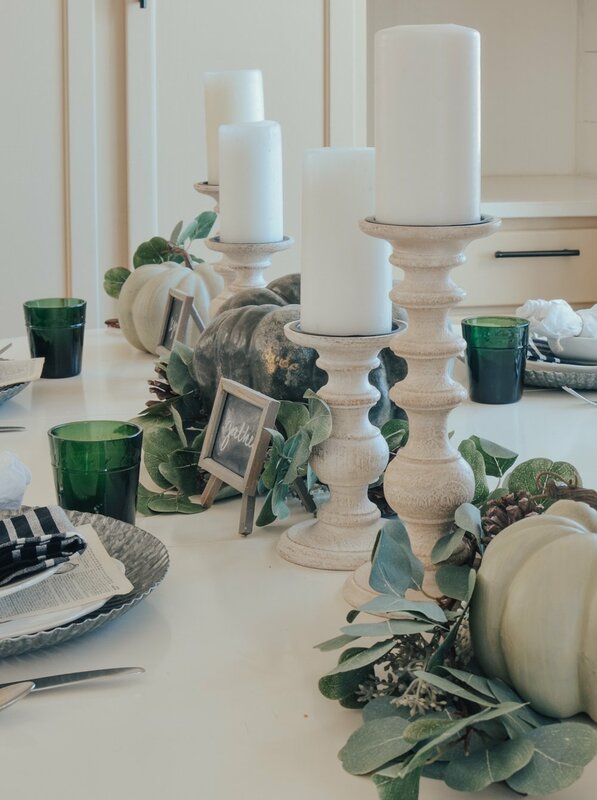 And I still kept it really simple with just a few pumpkins, candlesticks, and some greenery. I absolutely love this eucalyptus and pinecone garland and I think it works perfectly for any holiday look. But you don’t have to spend money on greenery–you could always go outside a trim a few branches to make your own. I’ve had these galvanized chargers for a while now and I love them. They add a bit of “fanciness” to the table, but they’re still casual at the same time. I also added a few vintage touches to this look with the antique cloth napkins wrapped in twine and vintage book pages slid in between the plates. Gather a list of what everyone in your family is thankful for and print each one on tiny sheets of paper. Then fold the paper up in aluminum foil and place in between two rolls that are prepared in a muffin tin, and bake. At Thanksgiving dinner everyone gets a “thankful” dinner roll to open up and read (and eat!). Play board games or cards as a family after your Thanksgiving meal. Gather supplies and paint Christmas ornaments together–everyone gets to make their own. The ceramic or wood ornaments work best! Make a no phone rule so that everyone can can stay present and focus on being together. Go to your local food shelter and serve as a family on Thanksgiving day. Watch Miracle on 34th Street together, or your favorite holiday movie, and drink hot chocolate to kick off the Christmas season. Reach out to someone who is alone, or even a family that is struggling, and invite them to join you for your Thanksgiving meal. Use a paper tablecloth and ask everyone to write down what they are thankful for–well wishes, notes, and the kids can draw pictures. Then save the tablecloth and use it the next year at Thanksgiving to reflect on the past year! Your table is lovely. I applaud you for being in the season of Thanksgiving and not rushing into Christmas. Your kids are adorable too! Have a blessed day! 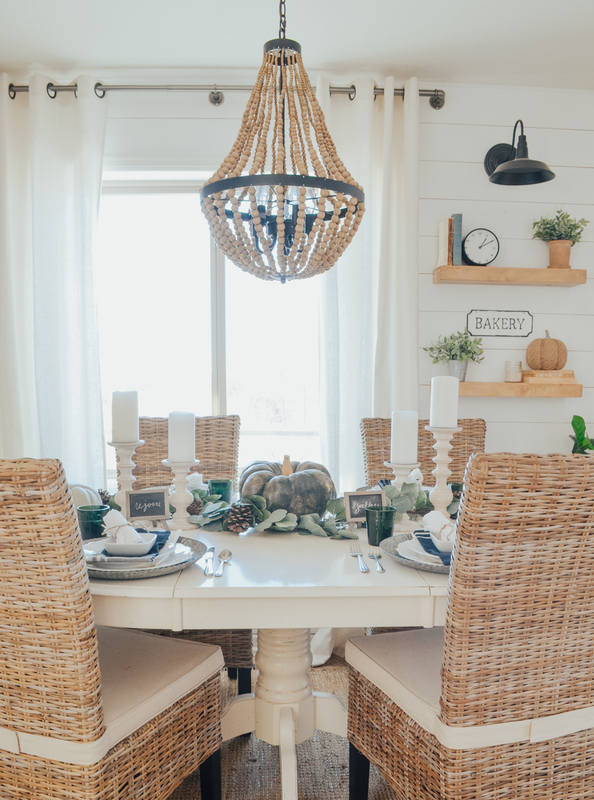 Love this Thanksgiving table. Was wondering where you found the cute blackboard message stands. Hi Pam, those are from Michael’s. 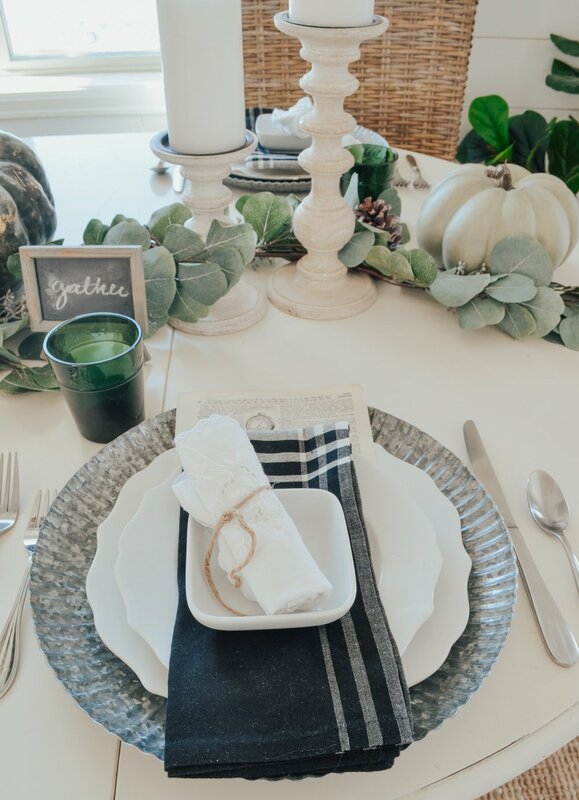 I love the look of this tablescape so much that I am heading over to Target after work today to purchase the eucalyptus and pinecone garland!! For Christams I put a large wrought iron lantern with a battery operated candle in the middle of my dining room table. 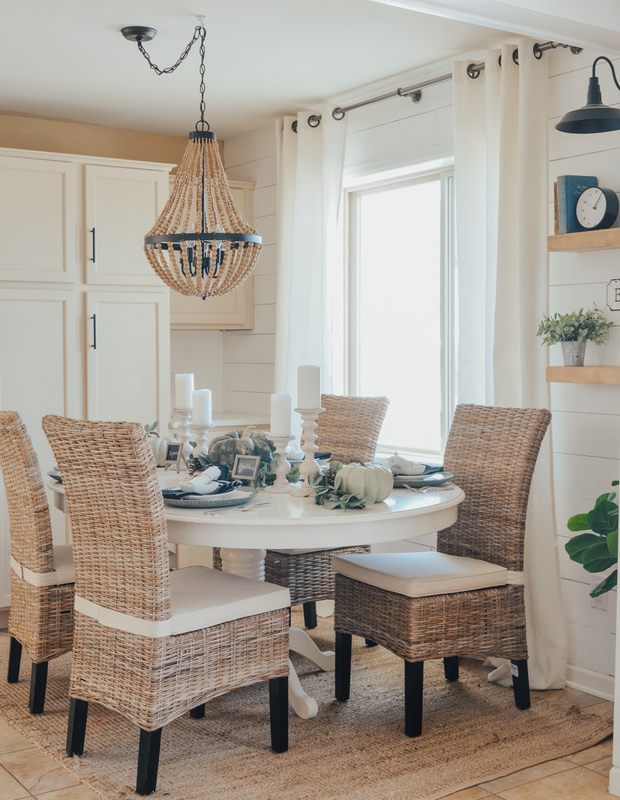 Well this year I am going to place a grampvine wreath on the table then place the lantern inside it and wrap the wreath in this garland….I am so excited!!! Thank you for sharing. I agree Dana, there is nothing like family time!! I had a friend who always set a pretty table. Sometimes it was just fresh flowers but if she was having several people she always would go a step above. As a guest I always felt special as I’m sure the other guest did too. i love how you decorated your table. A decorated table sends the message that your family or guest are worth that extra effort. Yes I totally agree Carol! Thanksgiving is also one of my favorite holidays. 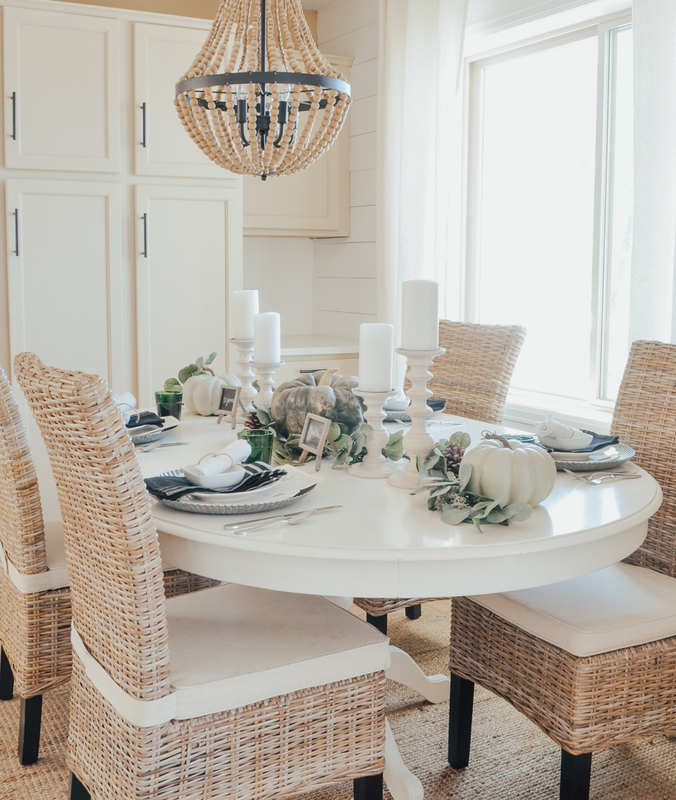 Your tablescape is beautiful because I love the simplicity of it. thank you so much Nancy, I love Thanksgiving too! 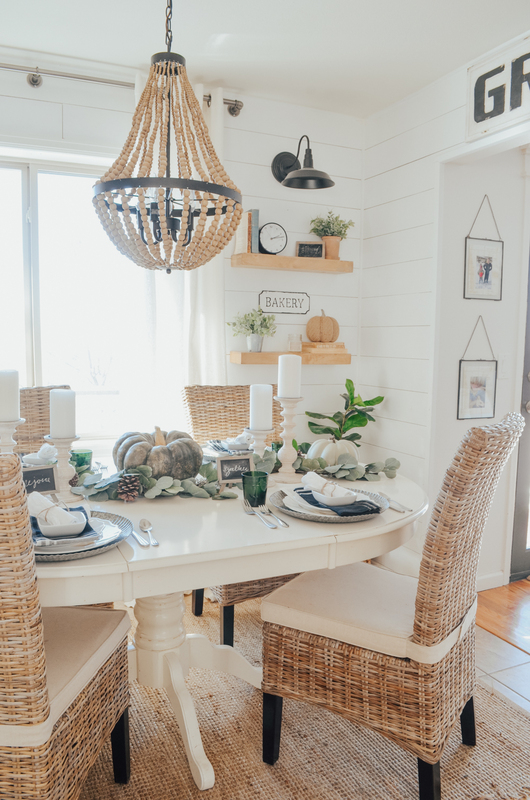 I love this table, and that you featured Thanksgiving amidst all the bloggers that are diving into Christmas and kind of sweeping the Thanksgiving decor under the rug. I still love them, but I just personally think we rush it and I want to enjoy the “fall” holidays before I jump into all things Christmas. Have a wonderful Thanksgiving! I agree Brenda, it’s sad to see Thanksgiving get such little “coverage”. But it’s still one of my favorite holidays! 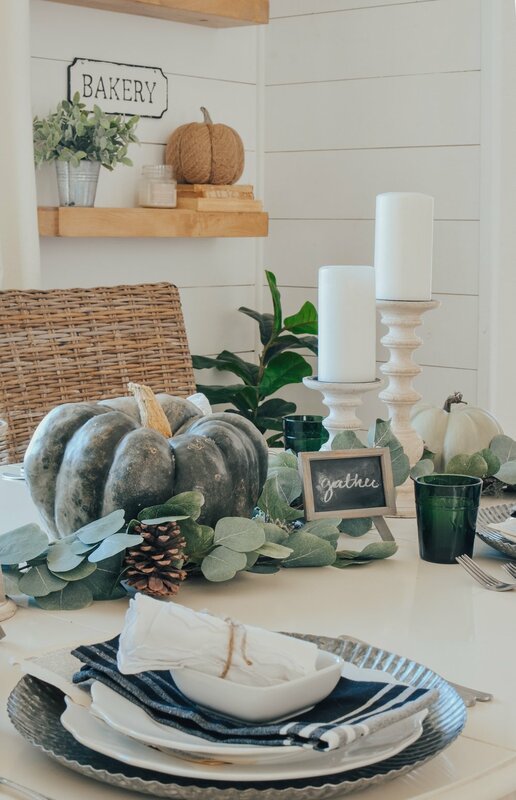 I love the whole tablescape but my favorite part of it all are those little chalkboards at each place. Those are the best! Where did you get those? Thank Tara, those are from Michael’s actually. Thank you for not forgetting Thanksgiving!! Your table is Beautiful. Those picture frames, with the chains…where are those from? I have been scouring every website and then some looking for just this. Thank you in advance Sarah!